Spray crockpot with cooking spray (mine needs it). Put in chicken breasts frozen, then dry onion soup mix, cream of mushroom and water. Cook on low all day (8-9 hours). Serve gravy over rice. Stacy's Notes: I used 2 frozen breasts and 1/2 can of water and the gravy was a little thin. (I think because the meat starts off frozen, you don't need much water). 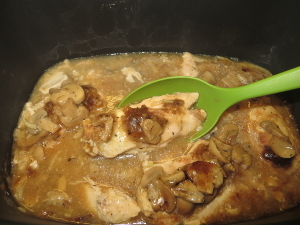 So, about a half hour before serving, I took out the chicken breasts and mixed some of the gravy with cornstarch, then added it back to the crockpot and turned it up to HI for about 20-30 minutes, to thicken the gravy. I also added a little bit of worcestershire sauce, some garlic powder, salt and pepper. Then I put the breasts back to warm, and served. We eat over brown rice.